Hi, this is going to be a very simple tutorial that will show you some suggestions that will help you avoid Massive View Controllers in your projects by making some refactoring following the MVVM design pattern, the single responsibility principle, and protocol-oriented programming. Let me start by telling you the story of Paul, he is a developer that really enjoys to code and watch movies, he is just starting a new app that will show available movies in cinemas, he is very proud of his app so far, he already created the network layer using URLSession (excuse Paul on this one for not using a networking library), he also created the model Layer using a value type and provided a failable initializer for his model just in case the data response from the API is nil. At this moment his app just shows the list of movies provided for the https://api.themoviedb.org API, and displays it in a tableView, nothing too complicated but is just the beginning of the project, he is so proud of his work on the viewController that at this point with 70 lines of code he named it MinimalVC. But what if his boss decides to add new UI elements programmatically into the ViewController, or also some other implementations of delegate methods of the tableView, what about some animation, who knows how does this app will end right? 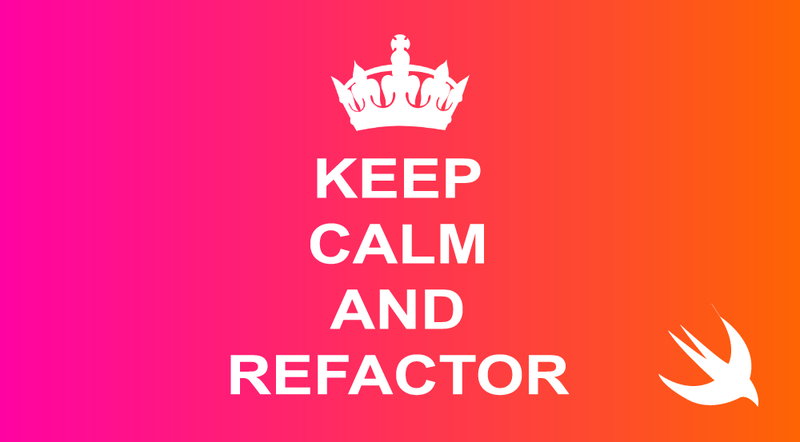 he realizes that although he is been doing a good job so far, he can do it better by making some refactoring, but he doesn’t know where to start, let’s help him. Let’s explore the files, as you can see most of the work is already done and because this is a refactoring tutorial that makes sense, you can see inside the service directory, two structs in charge of networking and parsing; a protocol in the protocols directory for extending UIImageView for caching images, a Movie model in the Model directory and a programmatically layout custom cell in the View directory. Let’s jump into the MinimalVC and start making some refactoring, if you been working with tableViews for a while I am sure that the code inside the cellForRowAtIndexPath caught your attention, at this point this method it’s not only responsible for cells allocations and reusability, it is also handling the representable format of the data model. Let’s use MVVM to create a ViewModel that will handle this instead. Start by creating a new empty file and call it MovieViewModel, let’s create a model that will handle the presentable representation of our data, copy and paste this in your empty file. self.voteCount = model.voteCount != nil ? "Number Of Reviews \(model.voteCount!)" : "No reviews"
What we did here? we extract the responsibility of formatting the data from cellForRowAtIndexpath and assign it to a new object, it takes a Movie object as a parameter on initialization and uses it to model its representation. Here we not only clean up our code, now our implementation is more readable and easy to test, we use the movie from the movies array to instantiate a MovieViewModel and then pass it to the cell to display it, cool we are making good progress so far but what else do you think that we can do here? What about this error handling in our method? In section one we declare a protocol called reusable, in section 2 we are using a protocol extension with a static property that will be accessible only to UITableViewCell types. In section 3 we are conforming UITableViewCell to Reusable, and in section 4 we create two generic functions, the first one will handle cell registration and the second one will handle cell reusability, both functions are constrained to the UITableViewCell class that also conforms to reusable. Cool, now how we use this? static let cellID = "cellID"
Add this one for cell registration on viewDidLoad. Also, now you can remove the guard statement from cellForRowAtIndexPath and use our generic function like so. Now we don’t even need to downcast the cell as an optional because all the safe check is handled by the generic function. If you want to see more about this implementation check this awesome article. At this point, we’ve been doing small changes in the ViewController and it’s looking cleaner but still feels like it is handling different responsibilities, by now it’s a tableview manager and a Datasource, and depending on future implementations it will potentially acquire new ones. Apple provides a default implementation for UITableviewDataSource and developers (most of the times) just stick with that. It’s important to follow the single responsibility principle and we will, by creating a new class that will extract the dataSource responsibility from the ViewController, we are going to do a bit of refactoring here and we will do it step by step. Your compiler is giving you an error and that’s fine it just telling you that this object doesn’t conform to the UITableViewDataSource yet, and we will fix that in a second, this object has a movies property and an initializer that takes as an argument an array of movie objects. BTW, if you are asking yourself why am I using a class instead of a struct, is because only subclasses of NSObject can conform to the UITableViewDataSource protocol. Here we just changed the constrained response from an array of optional movies to a MovieDataSource. Let’s see this code for a second, as you can see now we are instantiating a MovieDataSource object with the movieArray and passing it as an argument for the completion block, but also we changed the map function for the flatMap, but why? This is actually a very cool feature of this high order function, if you go to the Movie object model, you can see that because we provide a failable initializer we can get a nil object on creation, if we use the map function we will potentially get an array with nil objects on it and we will have to check if each object is not nil and move from there, but the flatMap will do the check for you and just return objects that were successfully initialized, pretty cool. Because of the changes that we did on the MovieService now the networking call is returning on success a MovieDataSource object that we assign as value to the movieDataSource property and then assign it to the tableView Datasource. So, why not just pass the result directly to the tableview Datasource? well, that’s because when you decide to go with this approach by separating the dataSource from the viewController you need always to assign the value of the Datasource to a property (that will hold a strong reference) first and then assign it to the tableview Datasource. Now run the app, and you should see that it looks exactly the same but now we made a lot of refactoring making our code more testable, cleaner and most important separating responsibilities between objects, let’s hope that Paul is happier now with a viewController with just 40 lines of code. I decide to write this because I didn’t find many tutorials about best practices in terms of refactoring, I am pretty sure that there is always room for improvement and if you have any thoughts it will be great if you can share them. If you are thinking, ok this looks cool but what if I want to use the DidSelect delegate method in the ViewController how does I get the item from indexPath without having access to the private array of movies in MovieDataSource? well if you can’t figure it out and want to know how to, send me a tweet or just leave a comment and I will potentially start a second part for this tutorial. Hope this help you in your future implementations!